Objective: To provide financial assistance to the unemployed people in the state in the mode of monthly pension. 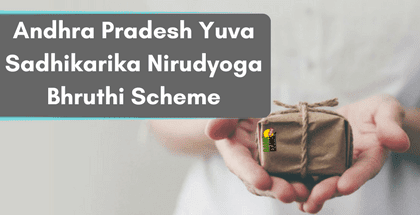 The state government of Andhra Pradesh has launched a new scheme named Andhra Pradesh Yuva Sadhikarika Nirudyoga Bhruthi Scheme on 12th Dec 2017 in Andhra Pradesh. Mr N Bangaru, the managing director of the Sports Authority of Andhra Pradesh has declared that this scheme will be going to benefit nearly unemployed youths in the state. Under this AP Yuva Sadhikarika Nirudyoga Bhruthi Scheme, the state government will benefit almost 10 lakh educated but still an unemployed youth of the state. The main aim of the Andhra Pradesh state government behind launching this scheme is to grant financial aid to the qualified jobless youth in the form of monthly allowance. For this, the Andhra Pradesh state government will accumulate age wise data of unemployed youth for the successful implementation of this scheme. The state government has also announced draft guidelines for the Yuva Sadhikarika Nirudyoga Bhruthi Scheme at youthservices.ap.gov.in and on Andhra Pradesh Youth Services Facebook page and expecting recommendations and responses from the people. All the ideas will be reviewed at a high level and then taken into the plan for the scheme. The last date for the submission of suggestions is 30th December 2017. The scheme will aim to give financial help to the eligible jobless youth of the state to help them survive. As said above, this scheme will be a kind-of pension scheme for the unemployed youth. The allowance amount of Rs. 1500/- will be paid to the jobless youth until they get a job and star to earn. The recipients have to fulfil the qualification criteria to avail the advantages. Students who have passed 12th standard will get Rs. 1000 per month as stipend. Those who have completed graduation will receive Rs. 1500 per month as stipend. The post-graduation students will get Rs. 2000 per month as stipend. This scheme will also be giving skill development training on the job training and other knowledge related training to the youth. The Managing Director of Sports Authority has declared that spoken English training and self-employment opportunities will be given to the recipients to make them industry ready. It is an Andhra Pradesh state level scheme, announced by the state sports authority. So the recipients must have the domicile of the state of Andhra Pradesh. The scheme is for the students who have cleared their higher secondary examination from a recognised board or equivalent will be qualified for the scheme. The eligible age limit for the scheme is of between 18 - 35 years maximum. As per the rule, only one unemployed person per family will be fit for the scheme. To implement the scheme the state authority will make a new database. Under it, all the age-wise data of the qualified beneficiaries will be collected. The registered applicants will be required to serve voluntary services to many sectors in the state. The state authority has declared that applicants can join in any welfare or development projects on a voluntary basis to collect hands-on experience in the particular field.